Tell us all whose artwork involving portraiture or figures you appreciated in 2011. In 2011, any artist creating portraits or artwork predominantly involving figures - real or imaginary - and posting their work to their personal art or illustrated blog can be nominated. Nominations are only accepted from people with an art blog. In order to nominate you must have an art or illustrated blog and be capable of being identified by me. I'd like to nominate Taryn Day's piece "Leah at Sea" (oil on panel, 6in x 6in). Her blog is Awake and Painting . The original post is Leah at Sea . Taryn's handling of the paint seems to reflect Leah's personality. You immediately understand that Leah is confident and adventurous. I'd like to nominate the wonderful portrait "Scarlet" (oil, 24"x 24") by Zachary Proctor on zacharyproctor.blogspot.com. It was posted on October, 21 2011, and is part of an ongoing series of what is to be 100 portraits. It's also worth looking at all the portraits in this series – unique individuals portraits with insight passion. Is is bad to nominate myself? I feel I have continued to grow this year and would like to share. SAY WHY YOU LIKE THE WORK -This is Nick. The painting shows who he is not just what he looks like. Feel free to post and use on Making a Mark. Tile and URL of the post.. I'd like to nominate David Boles for Best Portrait/figure for his drawing Candlelight II on his blog Cobalt Blues. David uses silverpoint and in this piece, a touch of gouache. His drawing is so technically sound, something that is seen less and less these days, that it becomes eye catching. His depiction of texture and values using silverpoint is masterful. I have no idea how these things work, but Antti's blog gets a malware alert when I go there. This has begun after my link in my comment, so I wonder if we took it down, perhaps the "short circuit" might end for his blog. Perhaps this malware adviser is actually responding to a link in a comment field, although I now see that the alert has narrowed the identity of the problem. Anyway, perhaps if we just take down my comment with the link, then this comment field will suffice, and we could see if poor Antti's blog gets the alert resolved. And now I will go and make another nomination. 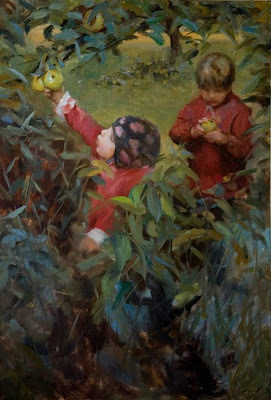 I'd like to nominate Natalie Italiano who is doing a daily painting on www.dailypaintworks.com of teenagers. It's a great project and she has a wonderful style, capturing varied personalities. Penny - check the details of how to nominate. I need the title and URL of just ONE artwork/portrait. Sounds like a project which might be eligible for best project - which is where I'll file it for now.